Both my babies were born this time of year, so I’m celebrating winter babies and offering this great special! Capture the sweetness of your new baby, all in the comfort of your own home. I rank newborn photos as THE most important baby purchase you will ever make. I promise you will cherish the photos forever, and look at them a million times for the rest of your life! This package includes 3 high resolution images on a CD with full print rights. Photos will be presented in a variety of Funfetti style filters, tones, and crops. Choose one 8x10 photo or 20 custom photocard announcements (photographer’s design). Online gallery for choosing prints and easy slideshow sharing with family. You will be eligible to earn up to three 4x6 free prints by posting your watermarked photos on Facebook as an album, as your profile picture, and on your personal blog. All other images from your photoshoot will be available for print/digital purchase and you may also purchase the entire CD of your photoshoot (edited and unedited. Approximately 100-200 photos. See a la carte print pricing). Siblings may stand in for an additional $20/child. Add-on: This package includes a specially priced add-on for only $40! Receive 2 beautifully printed 3x3 accordion books showcasing the best photos from your session. Save yourself the hassle of printing photos and let me do it for you. These make perfect gifts for your new baby’s proud grandparents. To take advantage of this special offer, please contact me and I will put your due date on my calendar. This offer is only valid for newborns with a Jan/Feb/Mar due date and photos must be taken within the first 10 days of life. Please review the "newborns" section of the details tab above. Because I have little ones myself, I can only travel up to 20 minutes from this google maps location. However, if you would like to bring your newborn to my home, I have done plenty of newborn photos in my home studio (aka my living room). Share this great deal with all your pregnant friends! 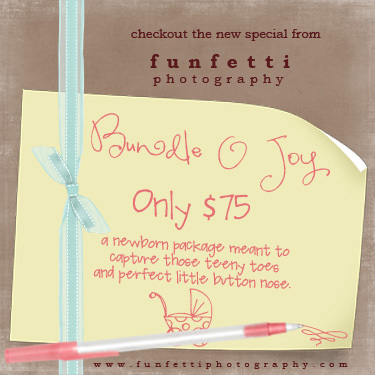 And don't forget about a FunfettiPhotography gift certificate for your next baby shower--they make great group gifts! This package will be listed in the "specials" tab above for a limited time only. Emily, I totally tweeted about this amazing deal. I only wish my sister lived closer because she's due at the end of March.